Foreword by Her Majesty Ashi Dorji Wangmo Wangchuck, Queen of the Fourth King of Bhutan. San Francisco and Tulsa: Council Oak Books. This stunning photographic odyssey spanning two-dozen extraordinary animal and habitat sanctuaries throughout the world is a celebration of the whole "sanctuary movement." Sanctuary embraces the rescue and rehabilitation of abused "farm animals" in the United States, of bears, wolves and an old forest in Europe, Asian elephants and tigers, rare orchids and other species in India, orangutans in Borneo, butterflies in Malaysia, rare plants in Yemen and cheetahs in South Africa. From Namibia to Bhutan, Sanctuary magnificently underscores the basic compassion and strategic ethics at the heart of 21st century animal rights and biodiversity conservation. 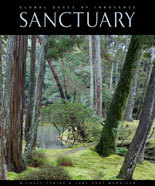 The formal Release of Sanctuary took place during and at the Smithsonian FolkLife Festival in June 2008. To order the book, click on Products on the main navigation.